This small and long size measures 30″ by 10″. The sign is yellow and has red and green details. To the left side of the sign is the Cosden logo in red and green logo. 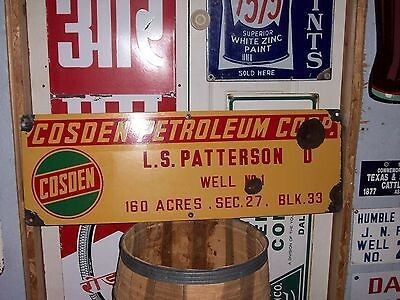 Above the logo in a red rectangle is the text “Cosden Petroleum Comp.” The rest of the text on the sign shows where the well is located. This particular sign says “L.S. Patterson D, Well No. 1 160 Acres, Sec. 27, Blk 33.” These are all location identification items.